Vertical support for a crosspiece, such as a signal gantry or an electric catenary. Support framework spanning several tracks used to display signals, such as tricolor lights and speed-limit panels. Building housing employees and controls for directing train movement in the station. 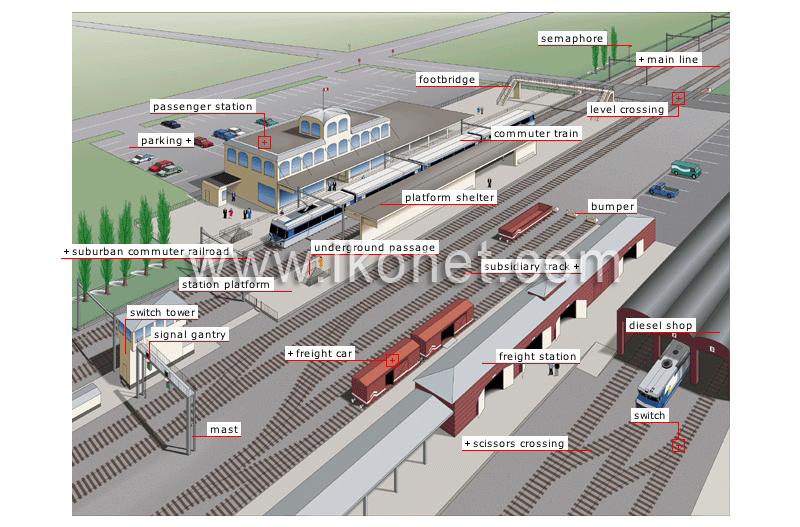 Set of railroad installations and buildings required for transporting cargo. Vehicle pulled by a locomotive for transporting cargo. Pedestrian tunnel connecting one side of the tracks with the other. Building for maintaining and refueling diesel locomotives. A pair of movable track rails (switch rails) for guiding the train from one track to another. Track enabling a train to change tracks. Railroad connecting an urban center to its suburbs and neighboring cities. Area alongside the tracks, for passengers to embark and disembark the train, or for loading and unloading cargo from the cars. Roof protecting passengers waiting on the platform from inclement weather. Side track not used for railroad traffic but for shunting, marshaling or loading and unloading. Local train running frequently each day between an urban center and its suburbs or neighboring cities. Elevated walkway for passengers to cross over a set of tracks. Buffer placed at the end of a track stopping the train from running off the end of the track. Light for relaying information such as the speed of trains and the distance between them. Intersection of a railroad and a road, with or without warning lights. Tracks for trains traveling long distances.